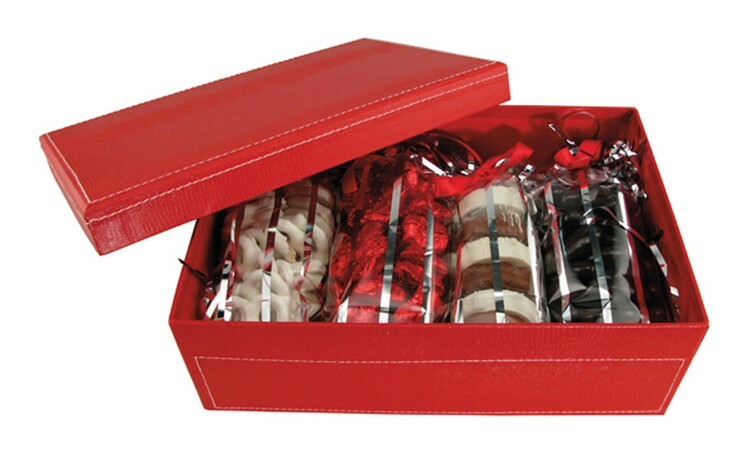 Leather-look gift box filled with 4oz bag of chocolate candy pretzel twists, 8oz bag of solid chocolate candy foiled stars, 6 pc bag of chocolate candy dipped Oreo cookies, and 8oz bag of chocolate candy almonds. Tied with your choice of ribbon color. Box available in red, black or brown. Makes a great food gift or holiday gift. Box makes a great keepsake box.